After the race last Sunday it was time to take it easy for a few days. The last thing I want now with things going so well is to have to go backwards. The good thing is unlike after the Danville half last month, I was having no pains other than the normal soreness of a hard race effort. So I took off monday from any running but I did resume the cross training. 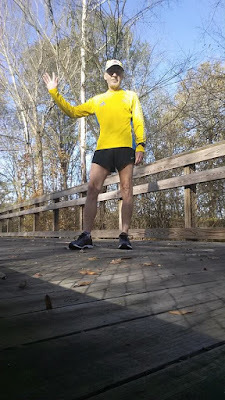 On tuesday I was a little rushed for time but wanted to get out on a nice afternoon and was able to squeeze in 4 easy miles at a decent pace. On Wednesday I was really surprised to feel so good on my 6 miler in the morning. After warming up I averaged about 8:30 pace for the last 5 and it was almost effortless. I guess I really am getting into decent shape again and the cooler (finally) Fall weather is so nice. Thursday was almost a repeat of Wednesday with just about the same pace for another 6 at an easy effort. 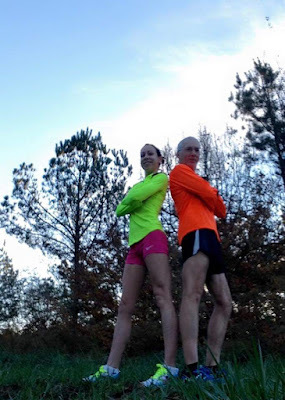 I was eager to resume Fun Friday with Laura and we were able to meet at the usual early 6:15 am at our normal place on the greenway. IT was perfect weather but only 5 days since the race so I didn;t know what to expect. We didn't plan a workout but just started running and just going to go with whatever happened. I was hoping to at least go sub 8 and after a warmup in 8:27 we just put it on cruise control. As always we were having a great time together and somehow I can still smile during a 7:33 mile with her. We ended up averaging 7:41 for the next 4 miles, the strongest tempo pace run snce the comeback and one of our best ever. In fact with a cooldown mile of 8 flat, we shattered the course record for the two of us by 30 seconds and it never felt like I was pushing too hard ! Woohoo ! I put in another easy 5 on Saturday at the now normal pace, sub 9 average. Then Sunday it was long run day. So far the longest run has been 14 miles and I was hoping to get in at leat 16. It was a gorgeous morning and the temps were great, about 45 when I started and 55 when I was done. I never really thought I was feeling all that good but I just kept ticking off solid sub 9 miles other than the ones climbing over the "hump" a hill that is Umstead worthy where the greenway moves away from the river for about 3 miles and I felt strong and had a decent pace over them. So I ended up with 43 miles for the week. Looking forward to some good weather and some solid training in the week ahead. Stay tuned.